The Sellada Apartments is located in the center of Kamari, 70 meters from the black sand beach. It offers bright accommodation with a kitchenette and a pool with a bar. Apartment with white furniture, air conditioning and a fully equipped kitchenette with a fridge and kettle. 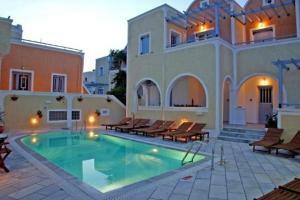 It has a safe, hairdryer, plasma TV and balcony overlooking the garden, pool or mountain. This air-conditioned apartment features a balcony, a safe, a hairdryer, a flat-screen TV and a fully equipped kitchenette with a refrigerator and a kettle.